On account of Polling, Thursday, 11th April 2019, is a holiday for all students and staff. On Saturday 29th Dec.2018,the entire school will get over at 02:00 pm. School to remain closed on 27th Nov 2018 for students due to mega debating event 'BEHES'. On the occasion of Eid-i-Milad, tomorrow i.e Wednesday,21st Nov.2018 will be a holiday for all staff and students. On Friday 16th Nov, the school will get over at 02:00 pm. On Saturday 17th Nov, participants from classes II to V only,to come to school at regular school hours and by regular transport. 19th October will also remain a holiday for students of KG to class V.
8:30 am to 02:00 pm for students of Primary. On account of Muharram, Friday, 21st Sept. 2018, is a holiday for all students and staff. 'The Iron Lady on Wheels' Ms. Sangeetha Sridhar,will be addressing the students tomorrow i.e on 19th Sept.2018,hence the school timings for 19th will be from 7:20 am to 12 noon. An amendment for classes III-V Thursday's timetable will be followed on Saturday 25th Aug, 2018. Thursday's timetable will be followed on Saturday 25th Aug, 2018. Discovery School Super League -2018-Powered by BYJU'S' ("DSSL")-India's Biggest National level Inter School Quiz Contest. "INDIA AS I SEE",a FREE Online Contest open for all school students on the occasion of India's 72nd Independence Day. On account of Teachers Enhancement Workshop Friday 3rd Aug.2018 will be a holiday for students of Pre-Primary and Primary. (Secondary and Senior Secondary will work as usual). Registration for SOF Olympiad session 2018-19(IGKO,IMO, NSO,NCO,IEO) has started. Interested candidates to submit Rs.150/ for each olympiad.Practice book (optional)for Rs.60/ per Olympiad and Rs. 110/for reasoning book. Last date for registration is 31st May,2018. 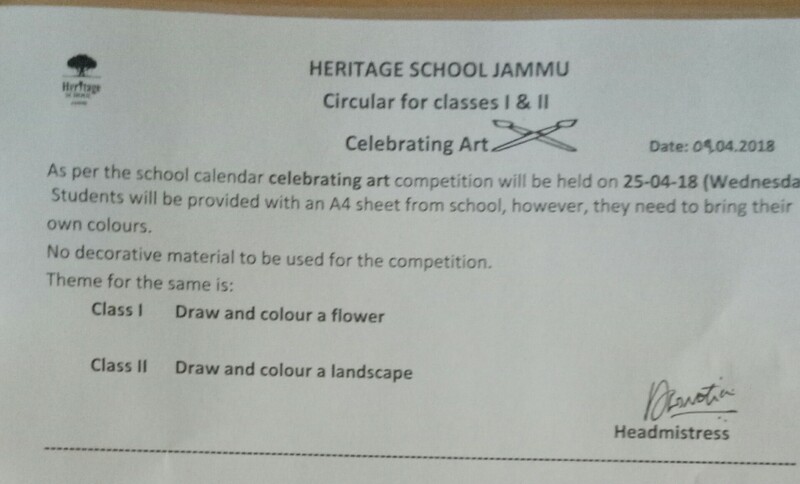 Celebrating Art Competition in classes I & II stands postponed till further notice.